Consumers are more connected than ever to their mobile phones. As mobile commerce continues to grow, so does the opportunity for your brand to stand out in a crowd of competitors. SMS's 98% open rate + our mobile landing page tool = A perfect Black Friday match. 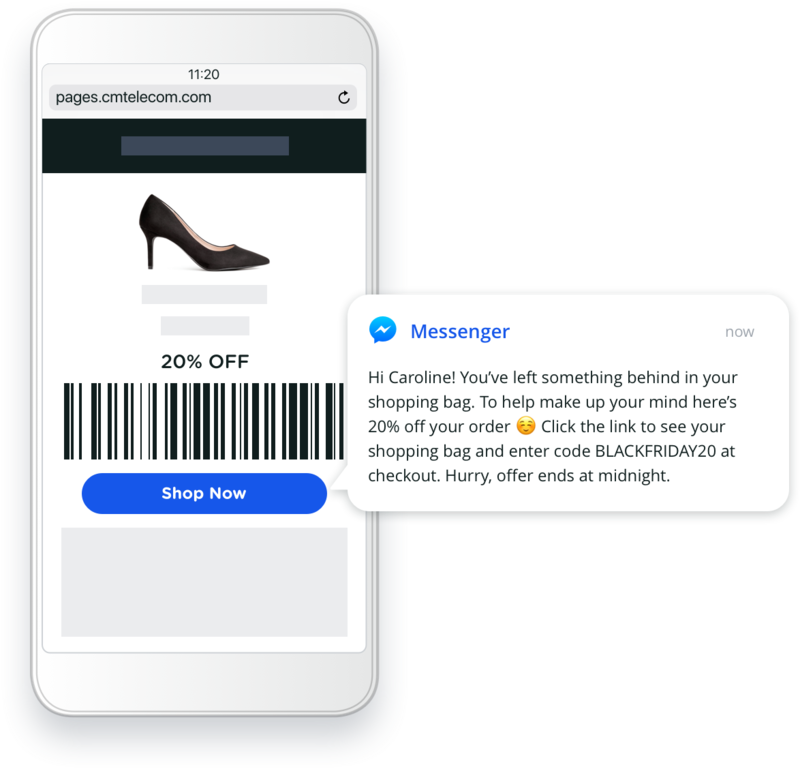 To get the most out of the Black Friday spending spree, you need to send out lots of mobile marketing messages to your customers. That's why we're offering 10% off our SMS pricing. Sending high volume? We'll create a tailor made offer. With so many emails and SMS messages going out leading up to Black November, the key to converting customers is to cut through the noise and offer personalised and relevant content...and of course, irresistible deals! Choose to send your Black Friday messages via our Web App or API. Did you know, the average abandonment rate for eCom shopping carts is 68%? Email has long been an important tool for marketers to recover abandoned bags, but new multichannel solutions are growing in importance. We've added a new channel to the mix using rich mobile landing pages. Simply upload your contacts, build your landing page and send via SMS. With customers spanning financial institutions, governments and retail industries, there can be no excuses when it comes to delivering your Black Friday messages. Our Premium SMS service has enjoyed 0% downtime and is unrivalled in the market. That's not all, our support is available 24/7. Black Friday is no longer limited to retail. From restaurants and fast food outlets, to online food delivery apps and travel booking websites, everyone can profit from the BFCM frenzy. The message may change, but the method remains the same. Customer expectations have matured, brought about by their own demands for convenience. They want instant communication and queries to be resolved quickly via the channels which are most convenient for them, especially during Black Friday. Be where your customers are and offer a competitive differentiator with CM Customer Contact, all inclusive for only R2,500 per month. Need more Black Friday marketing tips? To get the most out of your campaign, not only is it important to use the right marketing channel, but also the right message. We’ve created a list of 7 actionable SMS marketing tips for minimal effort and maximum return.